Oh what a day! We started out walking through the plaza and down the “tourist street” to pick up our mountain bikes which we rode a few miles to Lake Nicaragua. Lake Nicaragua is the largest lake in Central America, is home to fresh water sharks, and contains the largest island within a lake in the world. We planned to kayak around its 365 islets. The mountain bikes were nice…shocks and everything. They were somewhat needed for the bumpy streets too! We passed through local neighborhoods displaying the poverty of the country, by a farm near the lake where locals kept their horses, and through the park peppered with picnic tables by the shore to pick up our kayaks. Soon we paired up and ventured out on the green lake. Neysa was my buddy, and we paddled in fairly good sync as we zigzagged between the numerous islands, some of which were inhabited. An island may be purchased for $350,000. Towering above the lake was the cloud-covered volcano, Mombacho, that we hiked the previous day. We spotted a few birds on this warm morning and weaved through some hanging vines before drying off over a coffee at a lakeside cafe. After our short break, we hopped on our bikes and road uphill through more local neighborhoods to the cemetery, a small version of Recoleta in Buenos Aires. Marble mausoleums peppered the grounds. From the cemetery we rode to the rundown Fortress, before we returned our bikes and headed to lunch. Service is on the slow side in Nicaragua, though I’m not surprised as that is pretty common relative to the USA. We eventually made it back to our charming hotel, Hotel Colonial, located just off the plaza for a relaxing moment by one of its small pools before we began our next adventure at 4 pm. We took a 45 minute drive to Masaya Volcano National Park. The park is the first and largest National Park in Nicaragua and is home to two active volcanoes and five craters. We visited the Masaya Volcano. First we stopped right by its edge where we braved the sulphur gases and looked down into the crater. The crater was blanketed in smoke as the Masaya Volcano is known for its active degassing. It has erupted several times and even in recent years. La Cruz de Bobadilla towered above the crater on the northern rim. 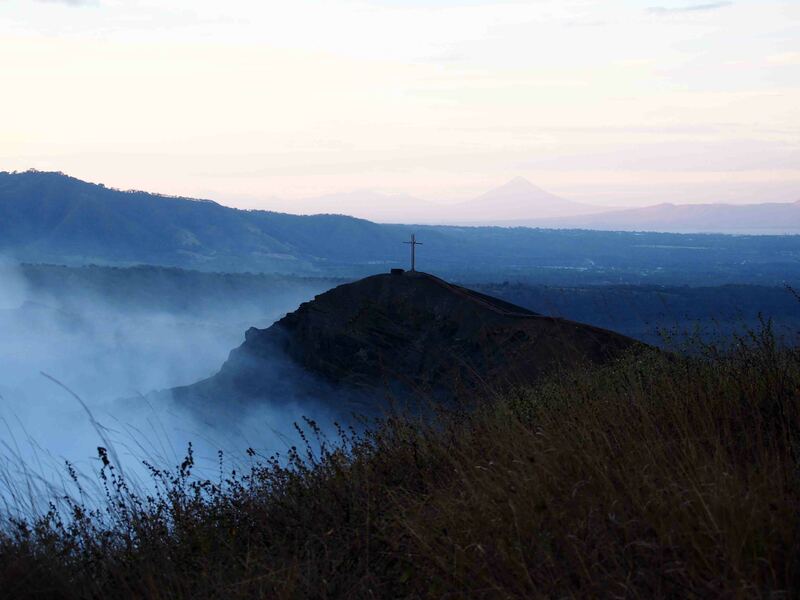 The cross was erected by the Spanish, who along with the indigenous feared the volcano and its frequent eruptions in the 16th Century, to eradicate the Devil from the “Boca del Infierno” (the mouth of hell). We followed a path that took us by the lovely cross to another viewpoint of the crater as we enjoyed the sun set. The hike didn’t stop there. We returned along the same path and then climbed a steep path of scree to a higher peak for a panoramic view of the park and beyond. We were able to see additional calderas, the Apoyo Lagoon, as well as the twinkling of lights from scattered towns. Our adventure continued as we were guided to a cave under the night sky. The Tzinaconostoc Cave is home hundreds of bats who leave its opening in mass exodus at night. Armed with flash lights, we aimed the light into the cave to watch the bats fly around. Not too far from the Tzinaconostoc Cave, is an underground tunnel created by lava streams. It was enormous and while donning our hardhats, it was so cool to walk from cavern to cavern which changed sizes due to lava bubbles. Stalactites were just starting to form, thus the lava tube was very young. After we explored the lava tube, we were supposed to drive to another area where we could see the red lava in the active volcano. Unfortunately, the gas and wind combined to be too overwhelming for us to enter that location, so we returned to the start, but couldn’t spot the lava.